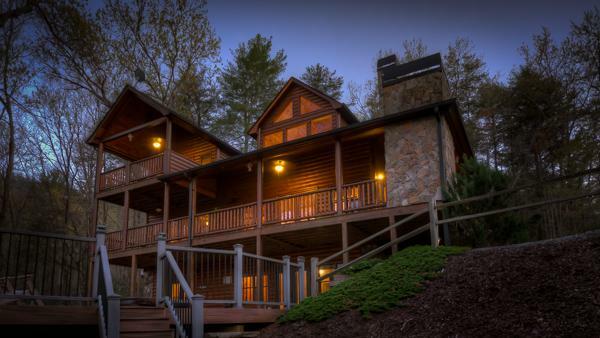 Laurel Valley Lodge is named for the mountain laurel covering the valley it overlooks. Approach this beautiful mountain retreat in springtime and you'll see pink and white blossoms around the cabin and throughout the valley below. Here, you'll enjoy spectacular mountain views, and your location in the popular Aska Adventure Area puts you close to everything. 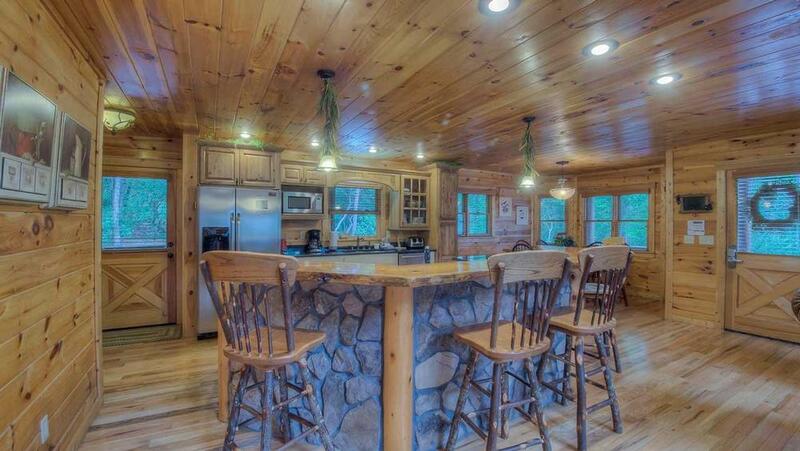 One of the few five-bedroom cabins in the North Georgia Mountains, this spacious lodge is ideal for large groups, family gatherings, holidays and business retreats. Good times are sure to 'blossom' here among the laurels! 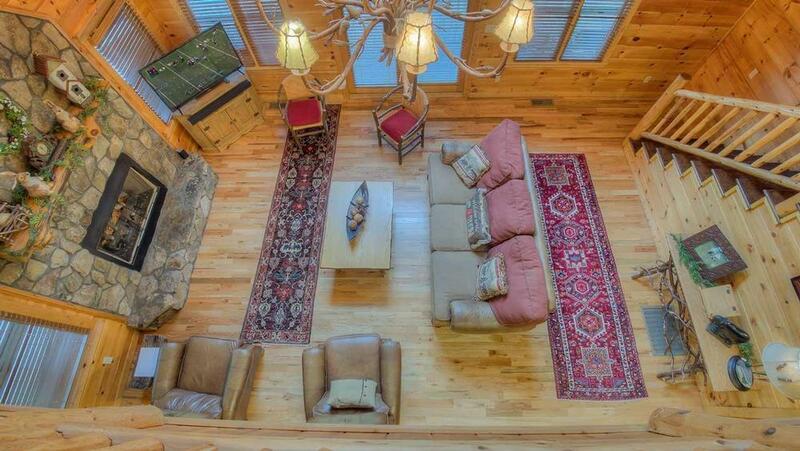 The living room will welcome you with its cathedral ceiling and enormous iron chandelier. 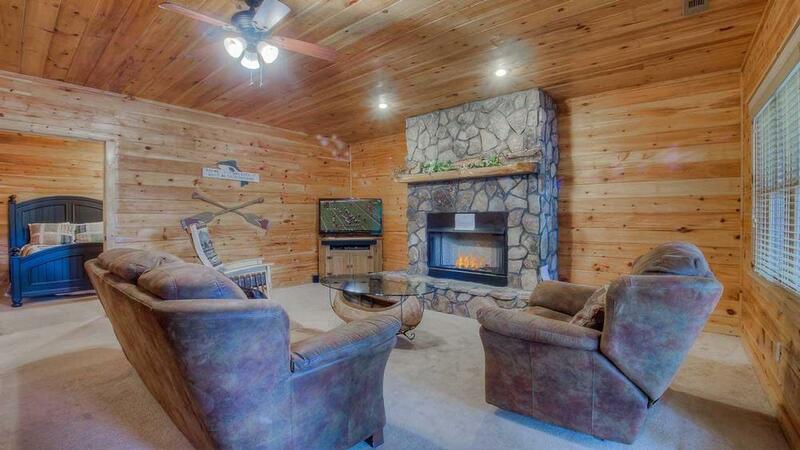 Sink into the leather sofa to watch a movie, or curl up in front of the fireplace with a glass of wine. Unique accents will delight you, from the twisted bark branch table and bird's nest lamp to the wood-carved guest book. And each room is imbued with charm, with tongue and groove wood throughout, hickory branch furniture, Middle Eastern rugs and rustic fixtures. Seasonal garland and arrangements celebrate nature's beauty all year, including a small Christmas tree at the holidays; harvest decorations in autumn; and ivy, birds and flowers during spring and summer. 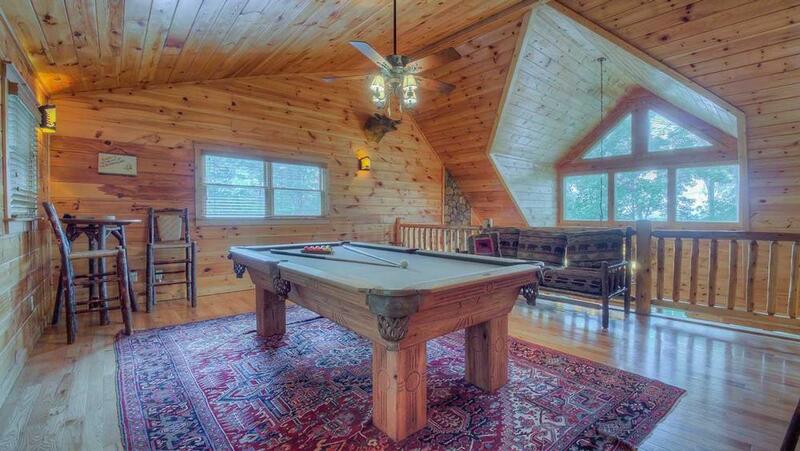 The upstairs loft offers a recreation room with a view. 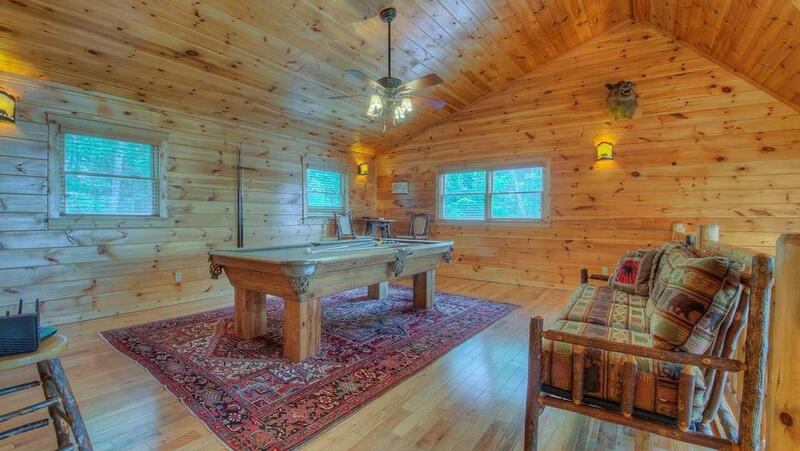 Play pool on the hand-carved billiards table, or have a drink at the hickory pub table while enjoying vistas of the mountain range and laurel blooming below. The second living room downstairs makes a great hangout for the kids. 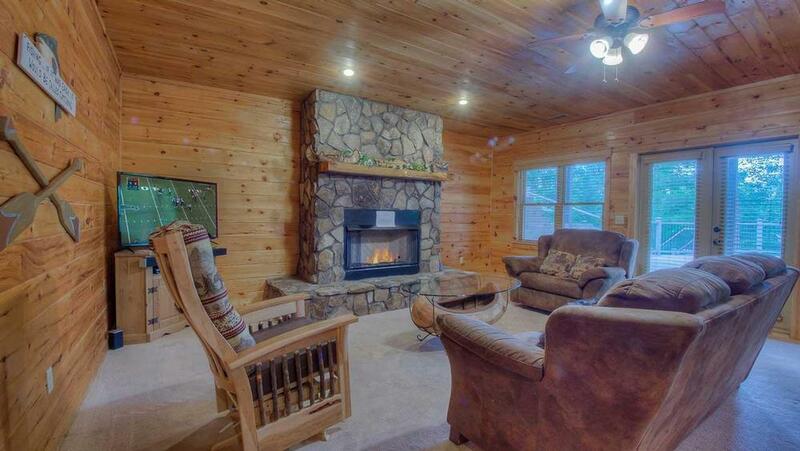 On rainy days, they'll love watching movies or playing board games in front of the cozy fireplace. Whether a holiday feast or Super Bowl snacks, you'll have everything you need to entertain in this fully equipped kitchen, featuring custom cabinetry, granite countertops, stainless appliances and gourmet cookware. 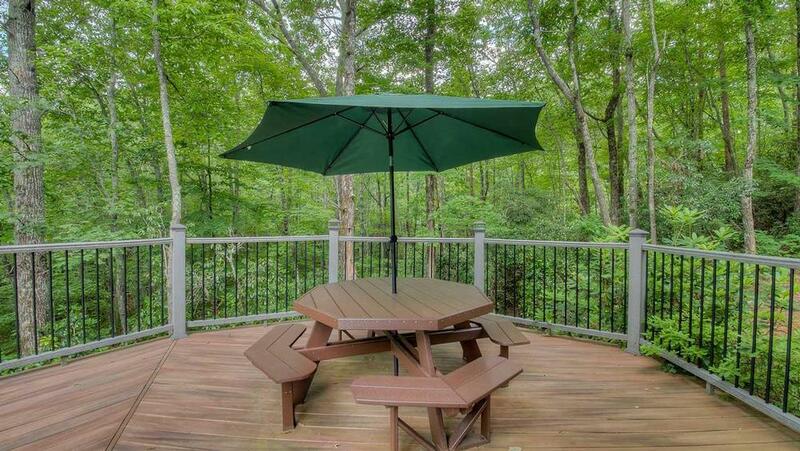 The main level's huge wraparound deck is perfect for outdoor entertaining. 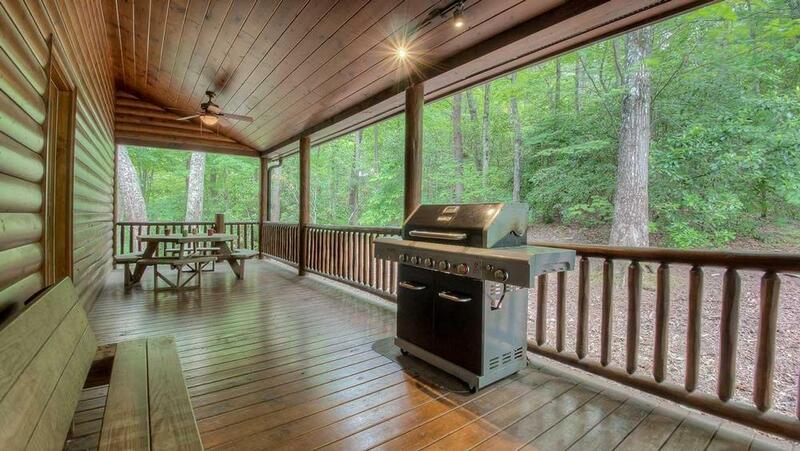 Grill the Georgia trout caught earlier from the Toccoa, and share stories around the fireplace. 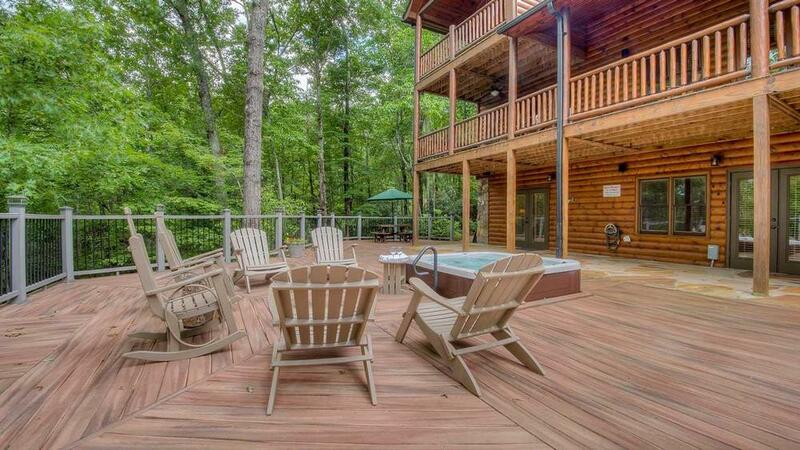 On the lower deck, relax under the stars in the sunken hot tub or enjoy a nightcap on the Adirondack chairs. Fascinating wildlife frolics outside your door. Bring some bird food, fill the feeders, and pour water in the birdbath, and you will be visited by a variety of colorful birds. Flying squirrels will also eat the bird food at night — grab your flashlight and watch them fly from tree to tree. You may also spot some deer, or even a bear! 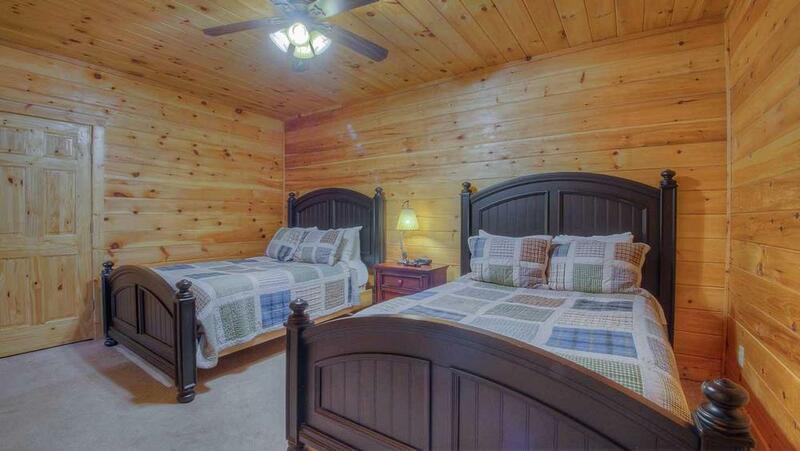 Each bedroom has its own theme, with hand-quilted bedding and variations of cedar and knotty pine. The 'Crow's Nest' bedroom is closest to the stars, reflected in the room's star theme — and in your views from its walkout porch. 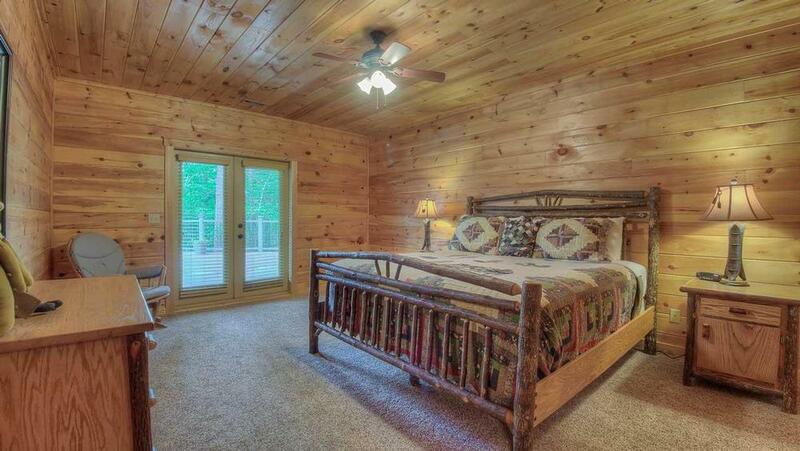 The main floor master has a twisted branch king bed and designer bedding. 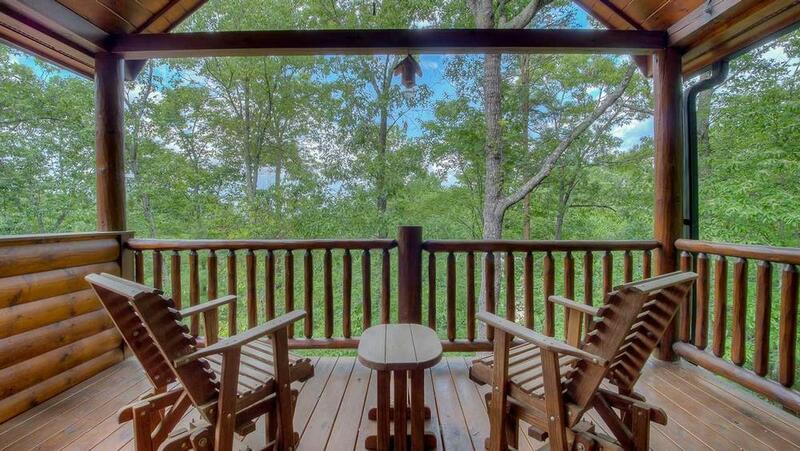 Indulge in a movie under the covers, or watch for flying squirrels from your private balcony. 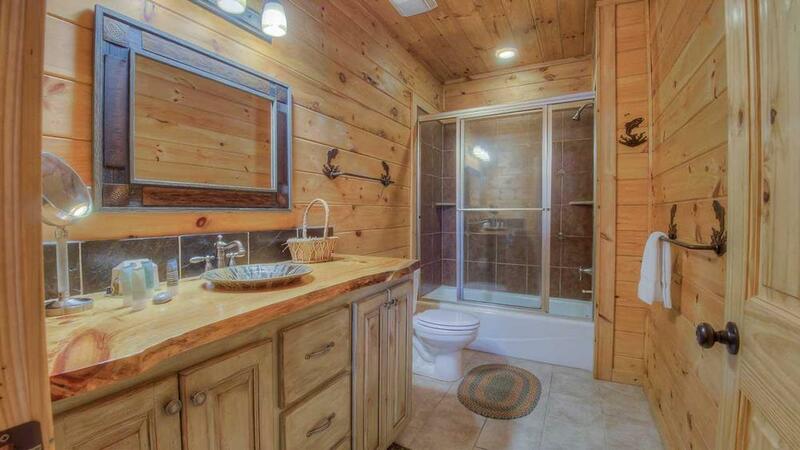 Also, there are two queen suites on the top floor loft area with its own bathroom. On the lower level, you'll find another master king bedroom and second bedroom with two full beds, perfect for children or single people. Whether you're seeking rest or play, this spacious retreat will provide a wonderful vacation experience for you, your family and friends. Happy memories of your stay at Laurel Valley Lodge will bloom and grow for years to come! 01/19 - My family and I enjoyed Laurel Valley Lodge inside and out. 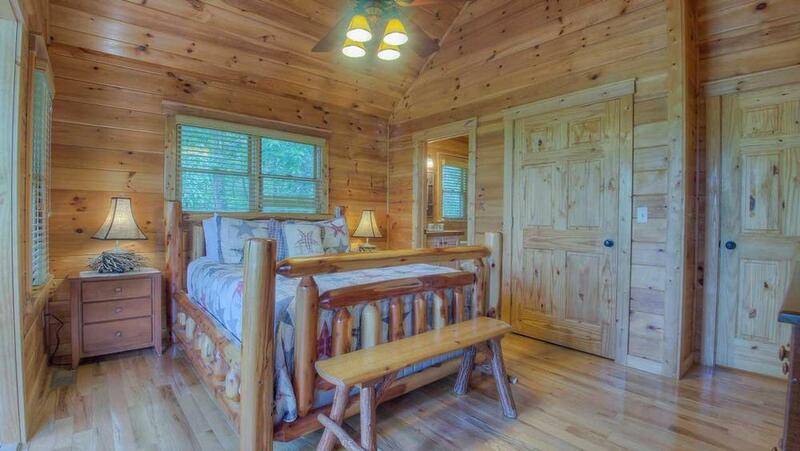 This cabin is extremely beautiful, comfortable, spacious, very clean. Look forward to returning. I luv this company, can accommodate all family sizes. 12/18 - I loved the fully stocked appliances in the cabin and the seating. Perfect and Amazing! 11/18 - The amenities and instant feeling of “home” when we walked through the door! This is the second time we’ve used Escape to Blue Ridge, our son Joseph has booked through you several times and convinced us that y’all are the BEST. We agree! 11/18 - This cabin was absolutely perfect! The interior design was very beautiful, the fire pit was so fun, cookware was stocked in the kitchen, the beds were comfortable, everything was clean... we couldn’t have asked for more! Great company! Every time I called, someone friendly answered the phone quickly and answered all of my questions. It was a very smooth vacation process and that speaks volumes of a great company! 10/18 - It included everything we could need. Great experience all the way around. 09/18 - The cabin was well done. They thought of everything we needed. Professional and over the top awesome. 09/18 - Very peaceful. 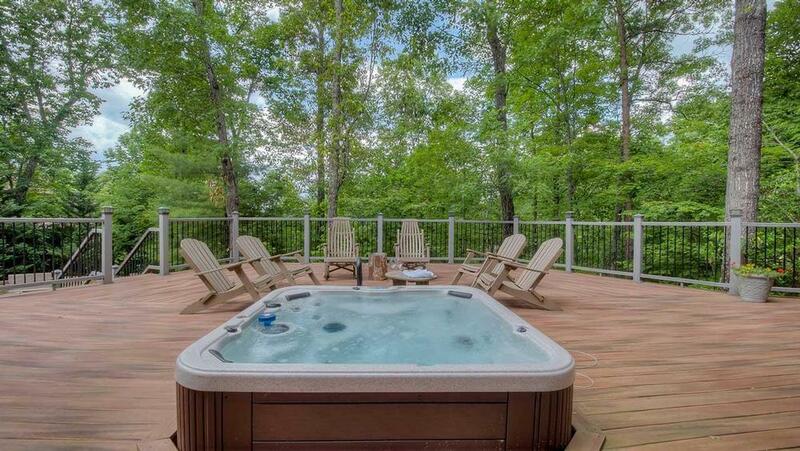 Love the outdoor hot tub. Very professional. Can't wait to plan another vacation with you guys. 08/18 - The staff was only a phone call away. I made a mistake and set the alarm off and had to call the office. They handled it very professionally. 06/18 - Spacious and well appointed home. Room for everyone in our party to be together. Escape to Blue Ridge staff is always quick to respond. 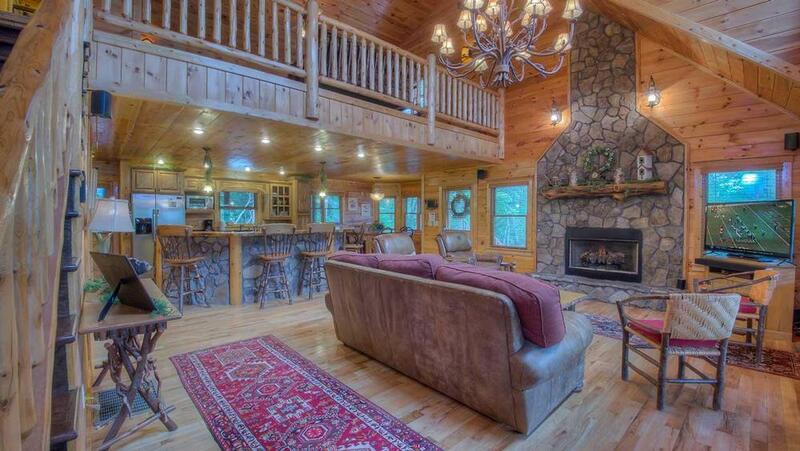 4/18 - The cabin was beautiful. Nice, secluded, quiet and serene. This is a great company and we will return. 3/18 - It had plenty of parking and it was easy to get to and it had so many extras - like the sound bars on the TV's - clearly the owners did not spare any expense - the furniture was very nice. I've used your company many times for family getaways. This was a girls trip and my first time making the arrangements. Everyone was very happy with the cabin. That's a hard bill to fill with 10 women. 2/18 - The home was very spacious and able to accommodate 8 of us easily. The views of the mountains from the game room were breathtaking. I would definitely recommend this house! From start to finish, you answered all my questions, took care of my needs, and made me feel very comfortable renting with you. Thank you so much for all your help during this trip! 10/17- The home was gorgeous with everything we needed. The beds were so comfy and there was plenty of space for a group of friends. Everyone was wonderful! The staff was so helpful when I had questions. I look forward to visiting other properties soon. 08/17- Very nice and comfortable for large family and friends. Very good. Helpful staff. 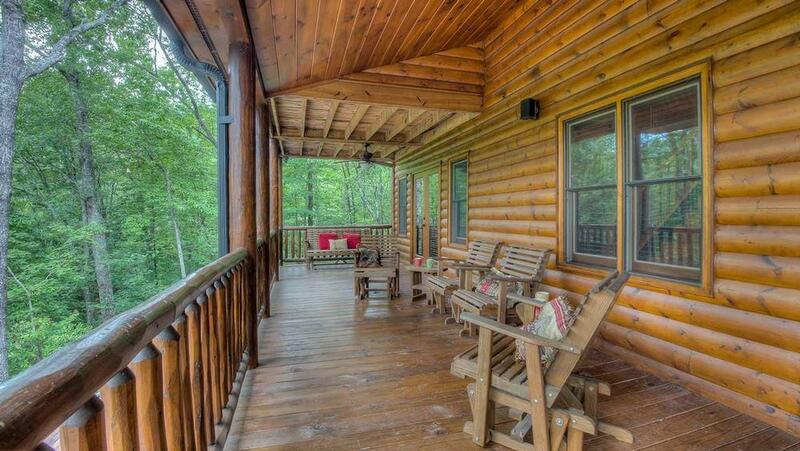 08/17- The cabin itself is very nice. We love Escape to Blue Ridge, the staff is amazing, very friendly. I actually recommended 2 families who rented from your company last week and many others previously. 07/17- We loved the openness of the kitchen where we could all sit around cook and socialize. We loved the pool table in the loft area, loved the fire pit and the hot tub deck area.......we loved everything about the cabin and will return soon. 07/17- I loved the space, the layout, the decor, we enjoyed having the pool table. 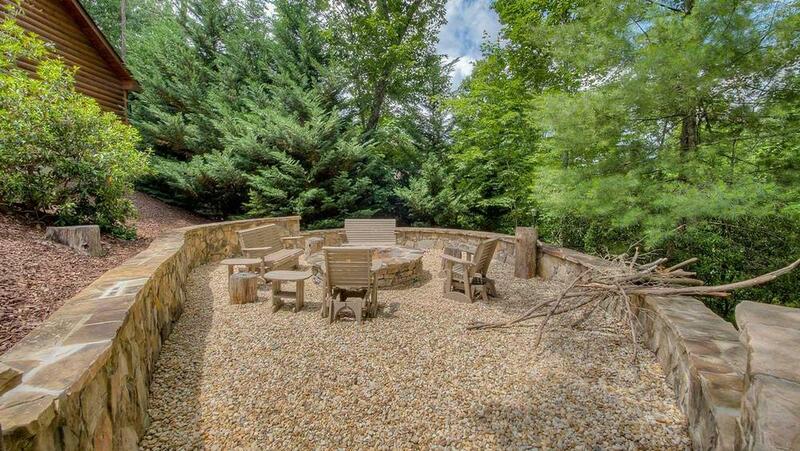 We LOVED the outdoor fire pit. The whole atmosphere of the place was very soothing, relaxing, and beautiful. The notebook was very organized and helpful for local things to do. Very helpful and very friendly staff. 07/17- Loved It. Great company, would rent again. 07/17- Enjoyed the peacefulness, and the proximity to all the entertainment. Very nice, you do your job well. 06/17- The home is beautiful, spacious and perfect for large families. There was enough space for people to be in the same room without stepping on each other, however at the same time provided privacy for those who wanted to get away and enjoy the view. Staff very helpful. Had a question regarding the hot tub and the staff assisted immediately. 06/17- The deck was great and the house was perfect for our group. Overall, Escape to Blue Ridge is great and I have worked with them for a number of years. When the Jacuzzi wasn't working they were patient in walking us through the problems. 03/17- We enjoyed the hot tub and fire pit. It snowed 2 days while we were there and we loved that. Escape to Blue Ridge staff has been very professional and helpful. 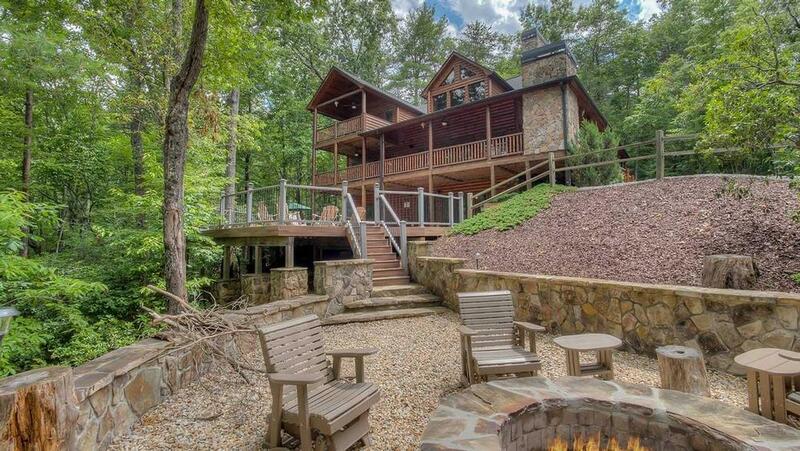 We chose them over another company before our last trip to Blue Ridge because they were so much more helpful and friendly and easily helped us find the perfect house for our family's vacation. 02/17- I was really amazed just by the amount of space this cabin has. The staff is very knowledgeable and very helpful, no matter what was going on. From the time of booking the cabin all the way through, Campbell helped me the whole way. Thanks, we had a great time! 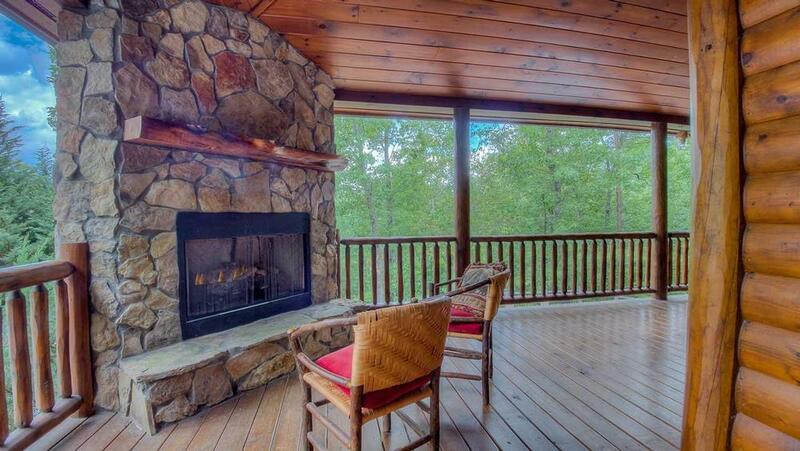 01/17- We enjoyed the wraparound porch, spacious rooms, games, and hot tub. The company is wonderful to work with, and are helpful in answering all questions. 12/16- This home was beautiful and worked really well for our needs. We LOVED the fact that the neighborhood greeter, Oreo, came to visit us each day :) I've enjoyed my experiences with your company. Everyone is responsive and friendly. The prices are reasonable. 09/16- Loved the hot tub and the fire pit! Great company! 08/16- The cabin was very spacious. 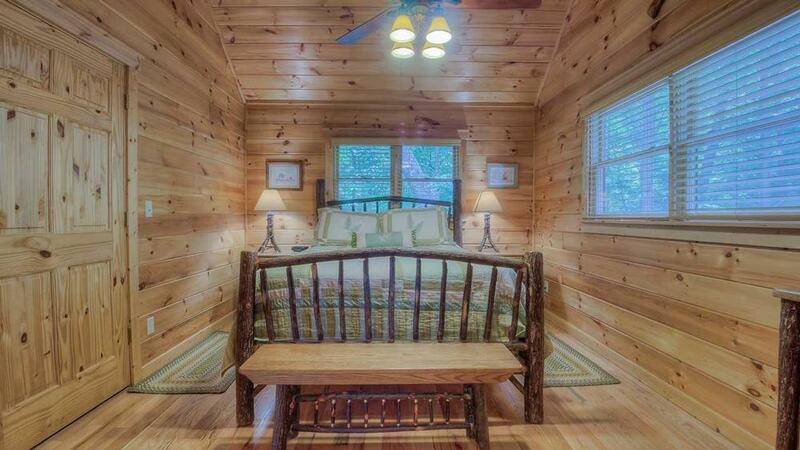 I loved the privacy and every bedroom and view was absolutely beautiful. We plan on staying again next year! The customer service experience was wonderful from start to finish. Campbell was fabulous! 05/16- Very nice place ! Just the right place from town.. Best trip out family had had in a while !! 04/16- The space, the sturdy furniture, the windows, the showers! Actually, these attributes are too many to name. What the company offers it delivers. This is our second time renting cabins here and we've never been disappointed. When there were issues with the stove and another with the dishwasher, a maintenance was sent out immediately. Although the problem with the stove was not resolved it was manageable. 03/16- Comfortable beds and plenty of space. 03/16- We have stayed in this house three times, and it's always great!! We have now rented from your company for years, and you have always been wonderful!! We take an annual girls' trip with sisters, mothers, and a niece. One time, bc of snow, the owners put us in a different house, and took us up the mountain! As we say, you could have said, "sorry for your luck" and sent us home. That is why we continue using Escape to Blue Ridge! So, thank you, and once again, everything was great!! 01/16- Big and beautiful. Even though it rained most of the time we were there, there was plenty of space for two families not to get in each others' way. Great location. 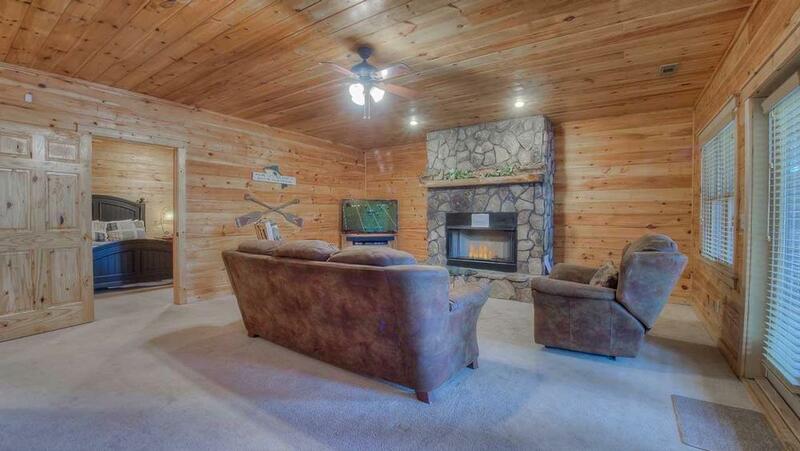 11/15- The cabin was beautifully decorated and we were supplied with everything needed. 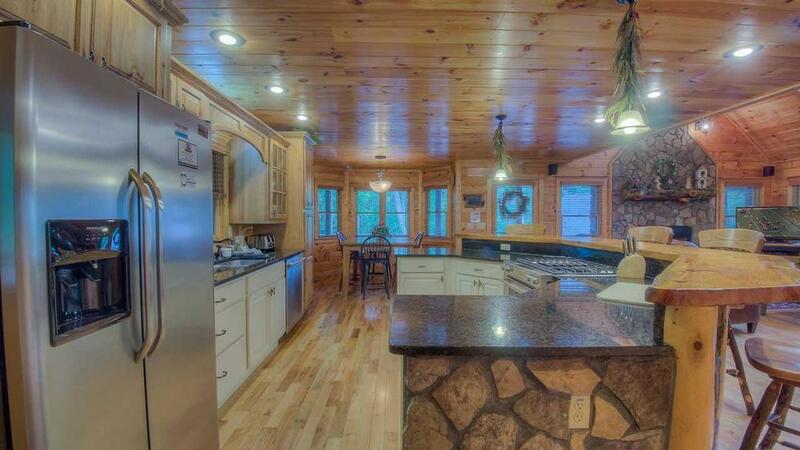 11/15- Very spacious, excellent kitchen that was fun to gather around. Experience was great. The staff was supportive and very responsive and willing to adapt to our needs. 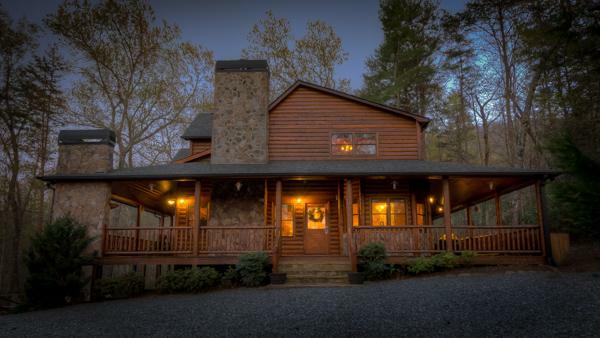 11/15- This was our second time to rent with escape to blue ridge. 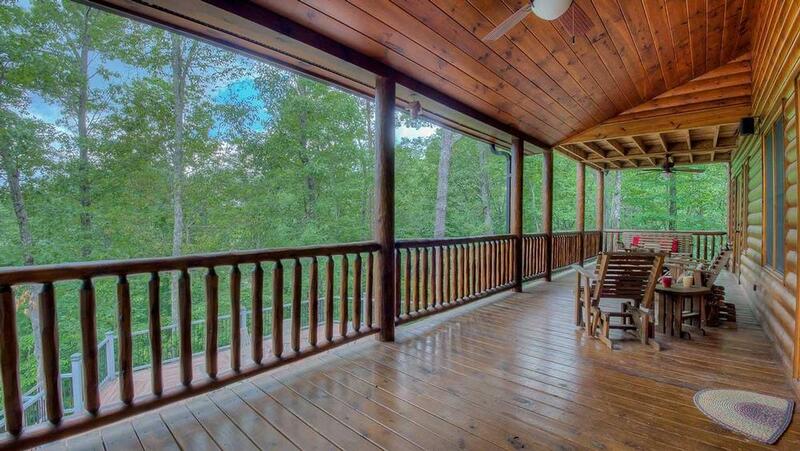 The cabins are beautiful. 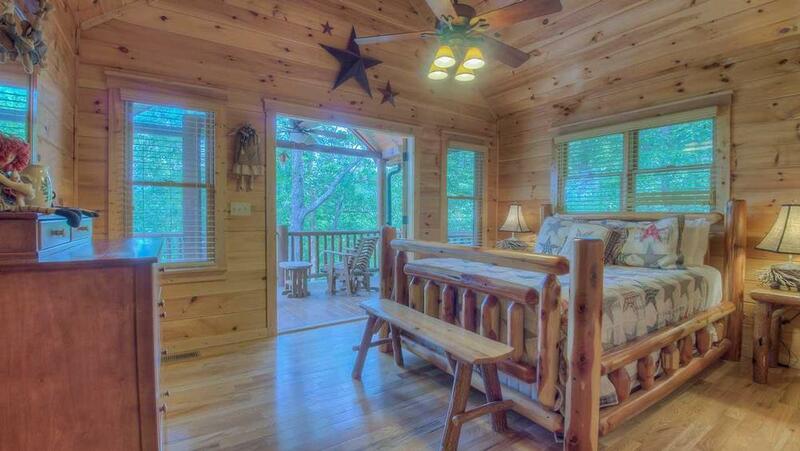 The photos on line do not do the cabins justice. 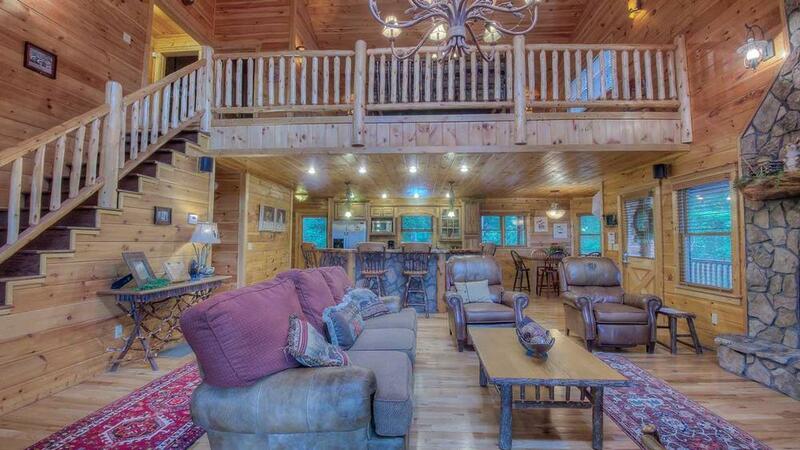 We enjoyed everything about the cabin! Your company is awesome and the so is the staff. 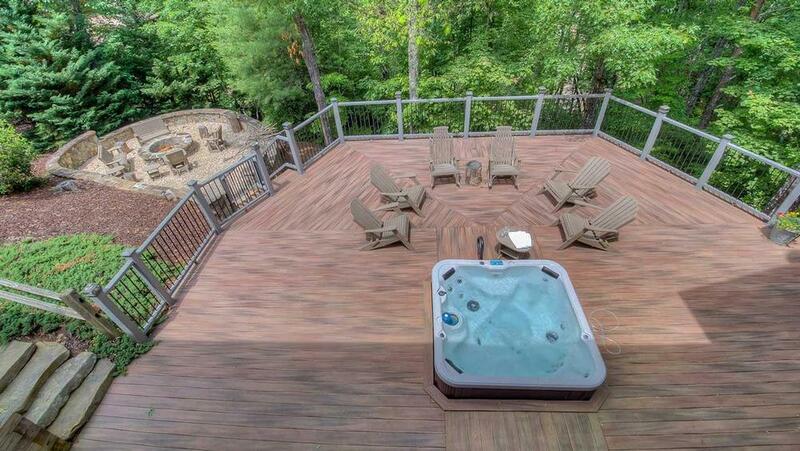 11/15- The size and amount of space, the hot tub location, the fire pit location. Company is always easy to work with and always responsive. 10/15- The cabin was large and spacious and was very clean. Easily met our needs. It has been a long time since I used your company, but as far as the staff, they were great. 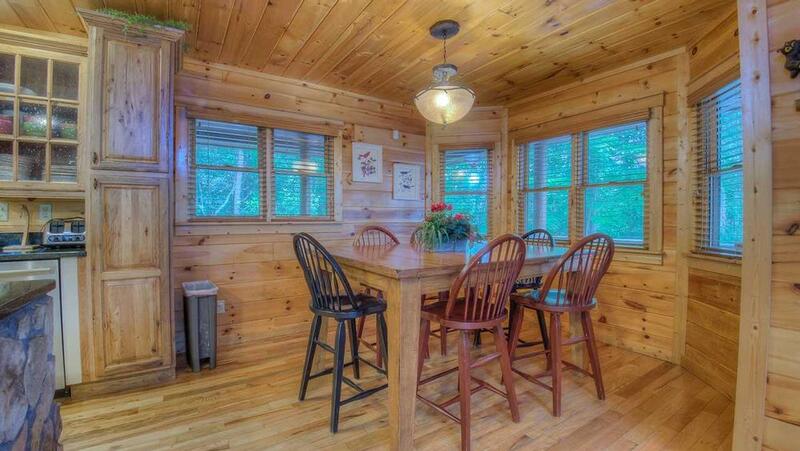 09/15- I thoroughly enjoyed the spacious rooms, outside deck(s)and quaint atmosphere. Pretty decent company. You all were very accommodating during the payment and rental process. Thank you! 07/15- We really enjoyed the fire pit and the outside decks. They were a big part of the reason we chose this house and they did not dissapoint. Excellent company to work with and great people. 06/15- Accommodated our 12 member family. We enjoyed the hot tub, pool table and fire pit for making Some\'Mors. Our party ranged from 73 to 15. 06/15- Since it rained a lot the week we were at this house, we loved having the covered porch. The floor plan of this house was perfect for our group. We enjoyed sitting by the fire pit and making S'Mores. The kitchen was very well equipped and I liked the way the cabinets and drawers were labeled. Love working with you-- have no complaints. Before I found you I was working with another company, and I definitely prefer yours!!! 02/15- We have stayed in this house before and all of your homes are beautiful! 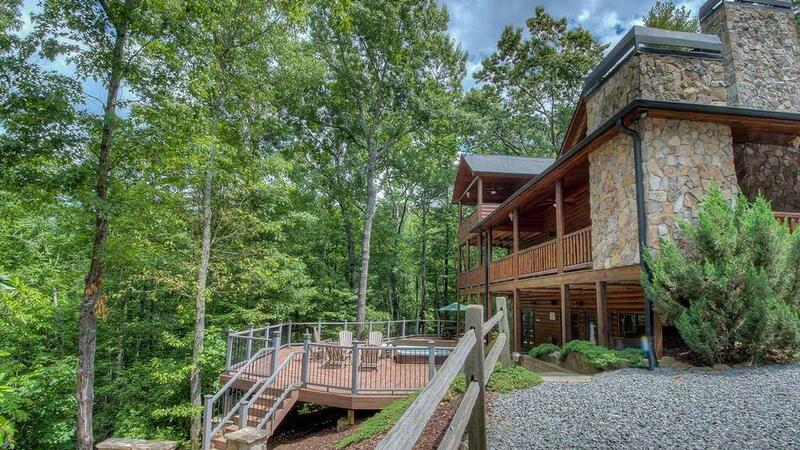 Escape to Blue Ridge has always been wonderful to us for the last several years and we will continue to use them. This is an annual family girls' trip, but we are thinking that we will come towards the end of March or beginning of April next year! This is the second year in a row where getting up/ down the mountain has been a concern with snow in February. 04/15- Lots of space. The beds were comfortable, kitchen was a good size. Loved the outdoor speakers. Everyone is very nice and easy to work with. Any questions I had were answered promptly. 02/15- The construction of the cabin is awesome and we have stayed at several. Loved this house. 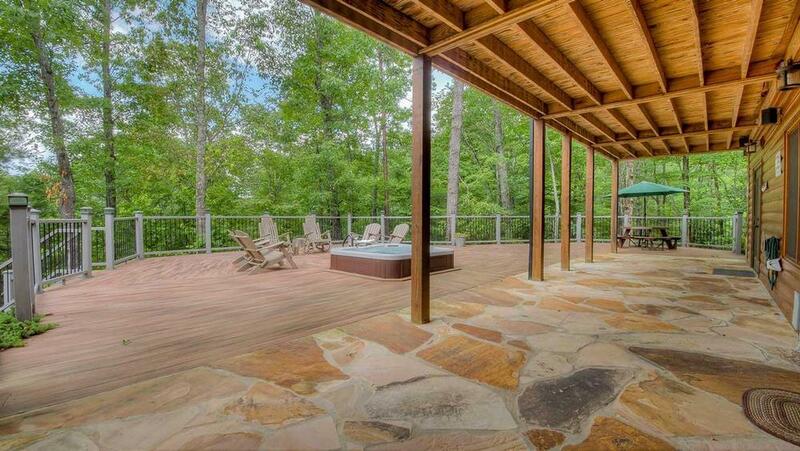 01/15- We loved the wrap around balcony, the fire pit in the backyard and the open kitchen plan. 01/15- The layout worked very well for our large family. There were a few safety concerns where we could have used baby gates but they would not stop us from returning. Very clean and full stocked with everything we needed. The kids loved the visits from the neighbors dog. 01/15- Too much to list, everything was great. 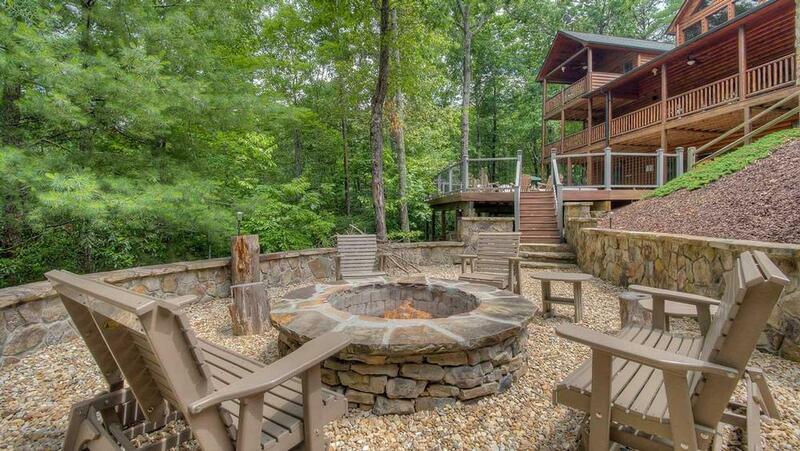 11/14- I love the fire pit and the openness of the cabin. Very good for family get togethers. 09/14- Large upper decking. 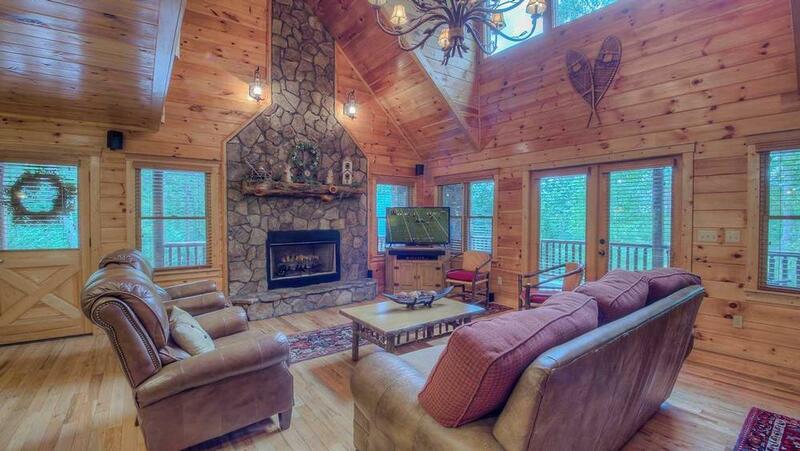 Rustic ambiance. Spaciousness. Great for a large group. Dog friendly. Thank you for making this a wonderful long weekend. 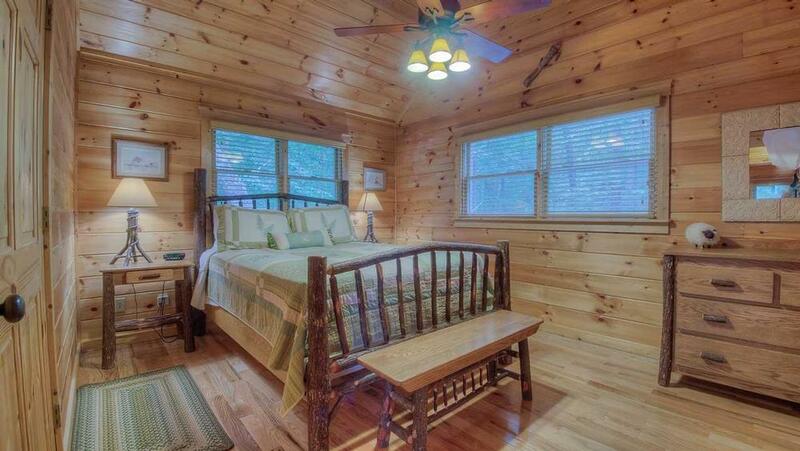 09/14- Number of bedrooms and bathrooms are why we rent this cabin. 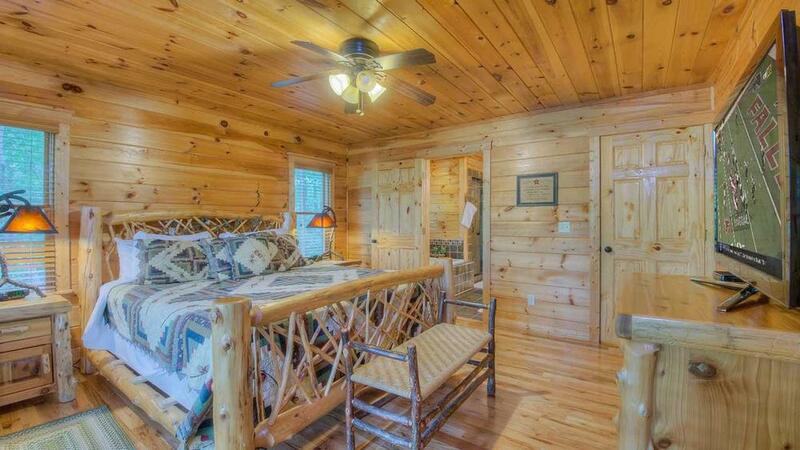 Have used you many times and have stayed in this cabin many time and have enjoyed the handling of my experience. 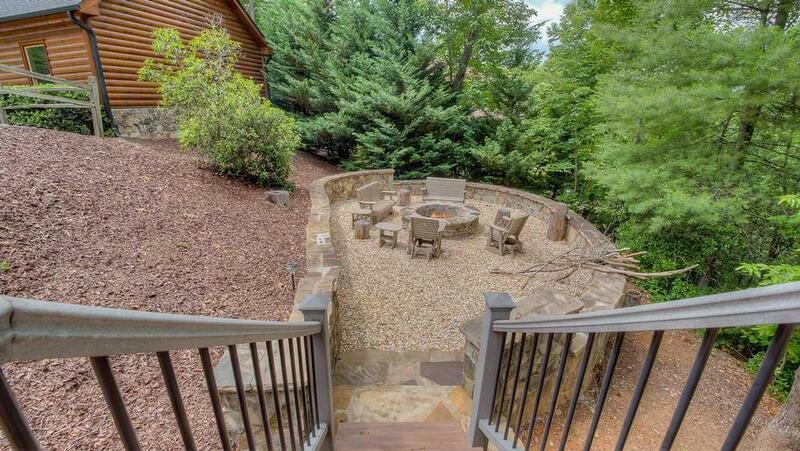 07/14- The large deck and fire pit area was great. 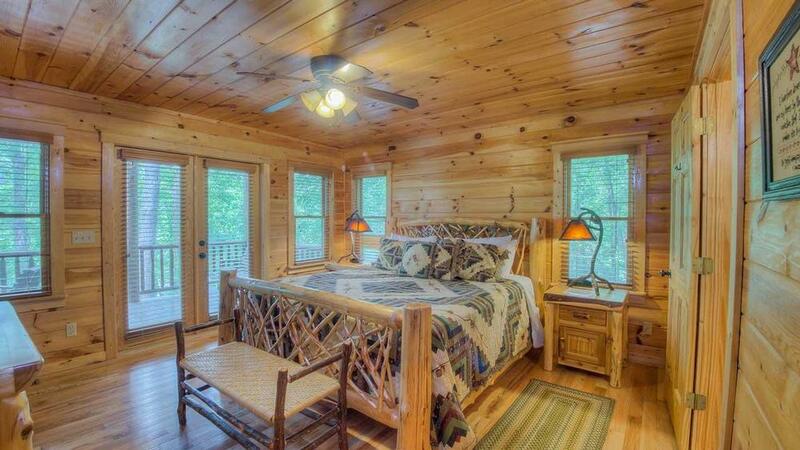 We have stayed in cabins managed by Escape to Blue Ridge on 5 different occasions now. 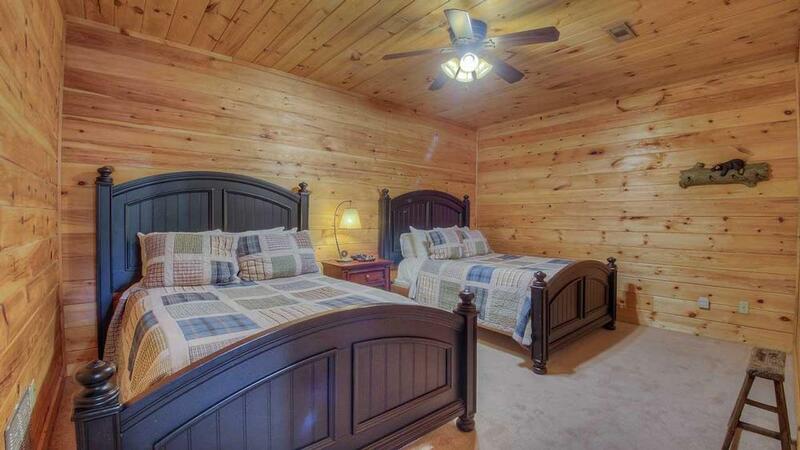 We are always impressed by the quality of the homes we stay in. The staff are very friendly and always accommodating! We travel to the area at least once each year and will ALWAYS use Escape to Blue Ridge!!! 7/21/14 Laurel Valley Lodge. 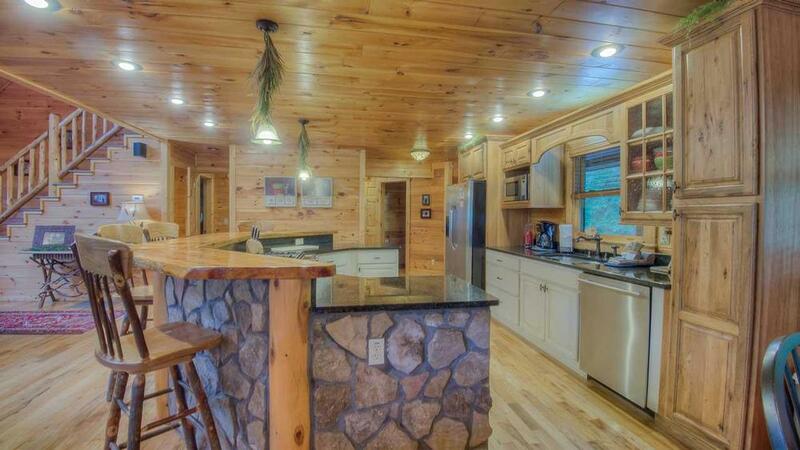 This is a beautiful cabin with a great kitchen, porch and family room. 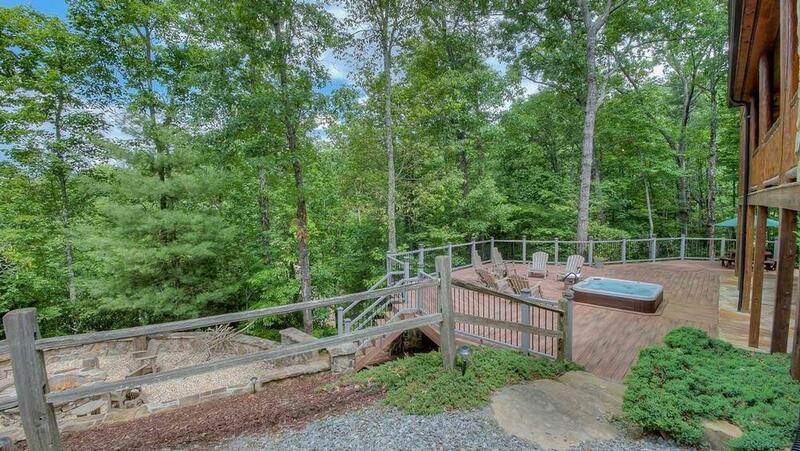 I love that the hot tub was in the open and not under a deck. We used the firepit often......great atmosphere. 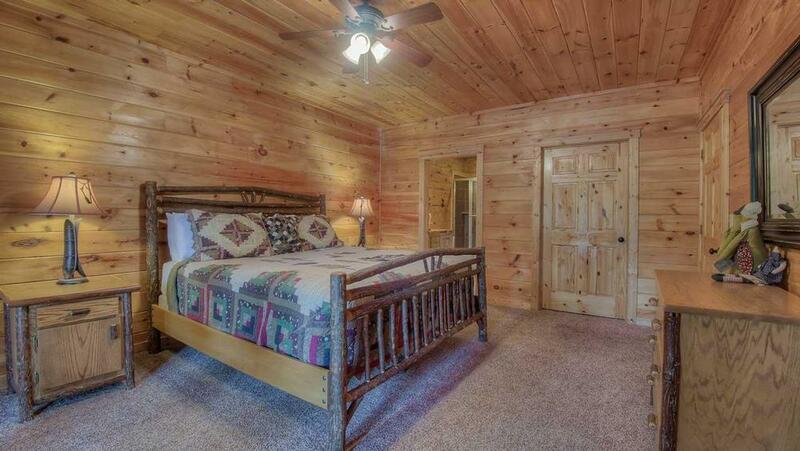 I do feel like guests need to be aware that the 2nd bedroom with 2 double beds in the basement has no bathroom access. 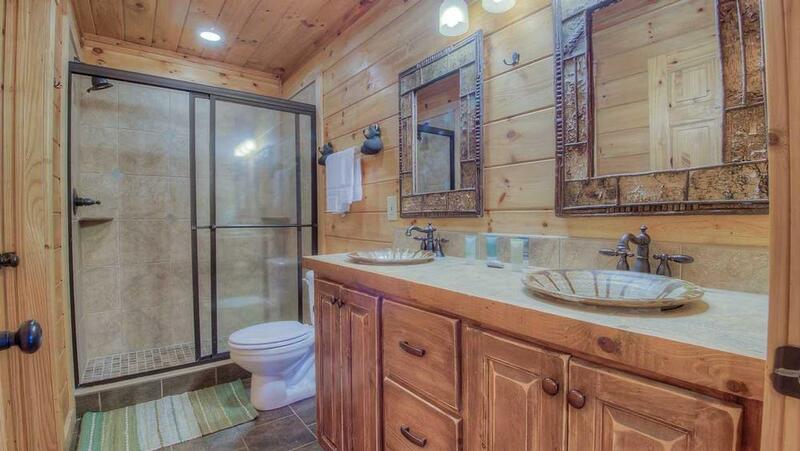 The other basement bedroom has it's own private bathroom and other guests cannot enter without entering their bedroom. 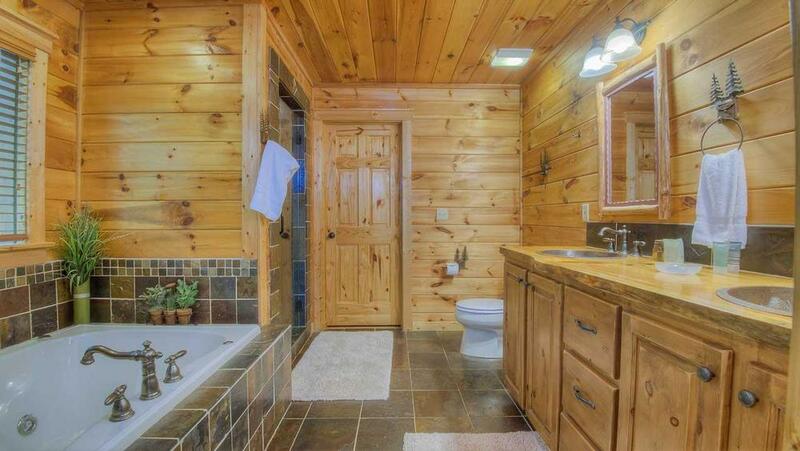 The master on the main floor has a fabulous bathroom and the upstairs rooms each have their own bathroom. 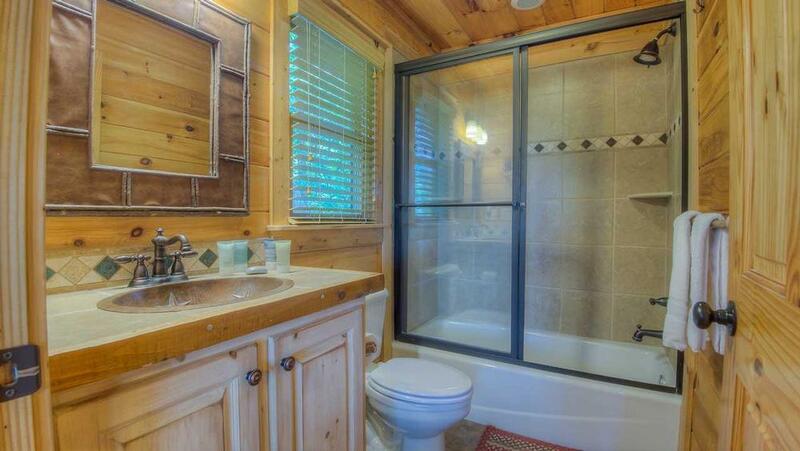 A half bath is available on the main floor and the downstairs guests came upstairs to use it. FYI All the information sent out in advance was extremely helpful. Thanks! 07/14- Our favorite part of the house was the deck on back of house with hot tub and the fire pit area adjoining it followed by the pool room in the loft.